Look up. That swatch of black hair streaking across the sky. Or is it a great raven twirling through the air currents? Now it slows, hovers. It’s all that’s visible. All that’s visible of him. Because, poet Jeff Poniewaz now floats over the freeway of our city and our life. He’s up there, with the departed whales of Milwaukee’s freeway. Why? Poniewaz means “because” in Polish. Here’s also why. 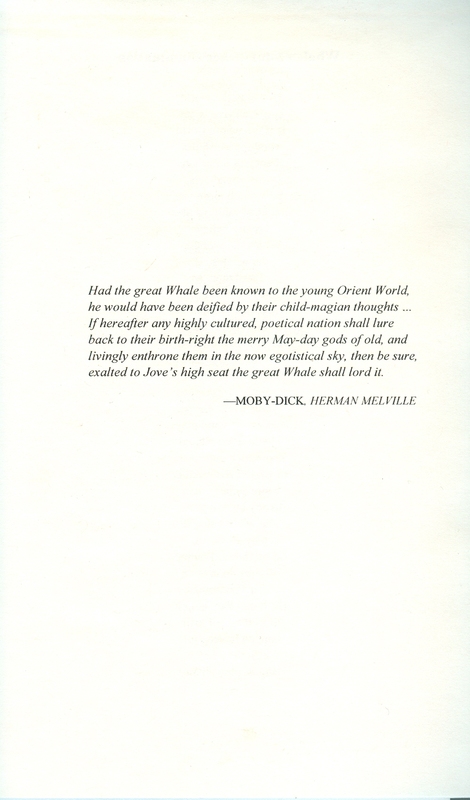 For what he wrote about those whales. That uncanny feeling of seeing Jeff arose yesterday from the title and meaning of his excellent 2007 chapbook Whales Hover(ed). 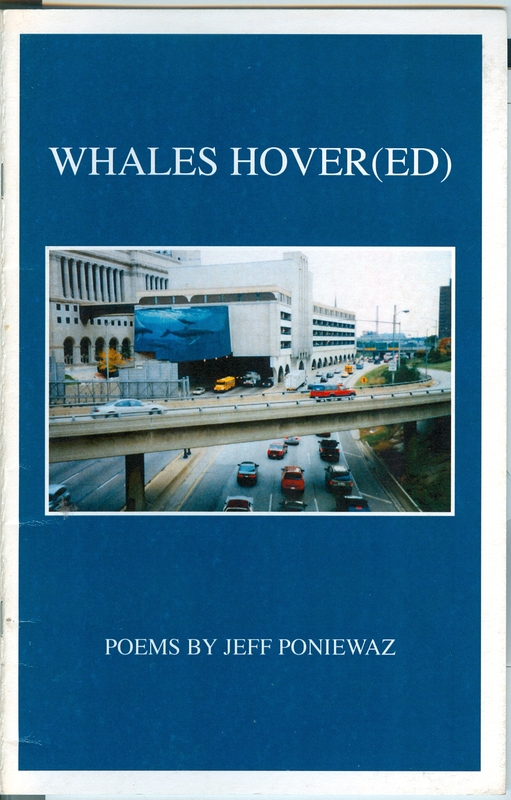 The title poem is “Whales Hovered Over the Freeway.” And it arose from the river of warm, rich memory of recent Milwaukee poet laureate Poniewaz that flowed through the overflow crowd at Feerick’s Funeral home Saturday. His 50-year partner Antler, another recent Milwaukee poet laureate, recalled his lost soul mate in glowing words, along with many other friends and admirers. 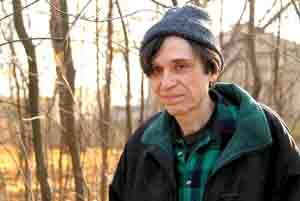 Since Jeff died on December 13, I had been searching for his slim chapbook which I had put on the book shelf facing my computer keyboard, amid a bunch of thick tomes, on Melville, music, writing and culture. Somehow it had eluded me. But yesterday after the memorial, I cast my eyes again across the row of books and something led me to the ocean-blue book’s unmarked sliver of a spine, nestled between a stout hardcover of Melville’s novel Redburn and poet Mary Oliver’s American Primitive collection. It felt like me spotting a black flash of Jeff’s hair, soaring in the sky, from the corner of my eye. So I retrieved one of the strongest statements this eco-poet ever made about the natural word and art, about human over-development and misplaced priorities. 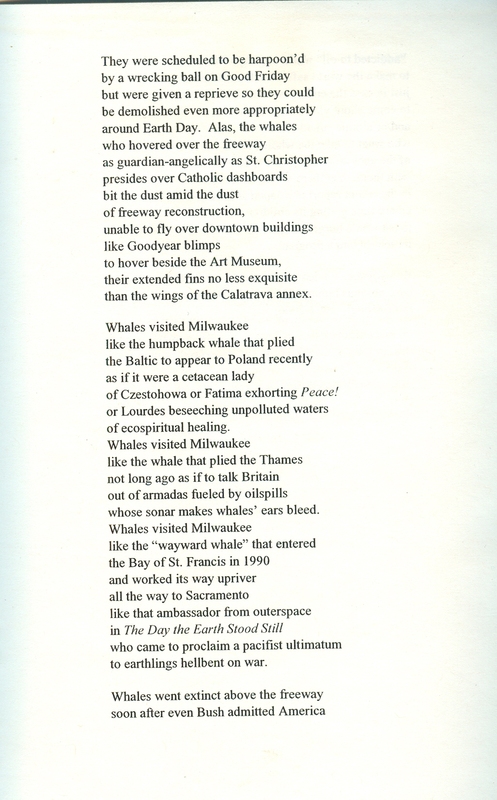 The poems deal with what was Milwaukee’s portion of The Whaling Walls, a vast array of stunning life-size murals of whales by artist Robert Wyland. His whale murals enchant and lend meaning to over 100 other cities worldwide, a remarkably ambitious and laudable cultural project which, unlike much public art, rarely causes controversy, for the beauty and accessibility of the art. Here, Wyland’s mural had adorned the County Courthouse complex over the I-43 expressway entering the Marquette interchange. 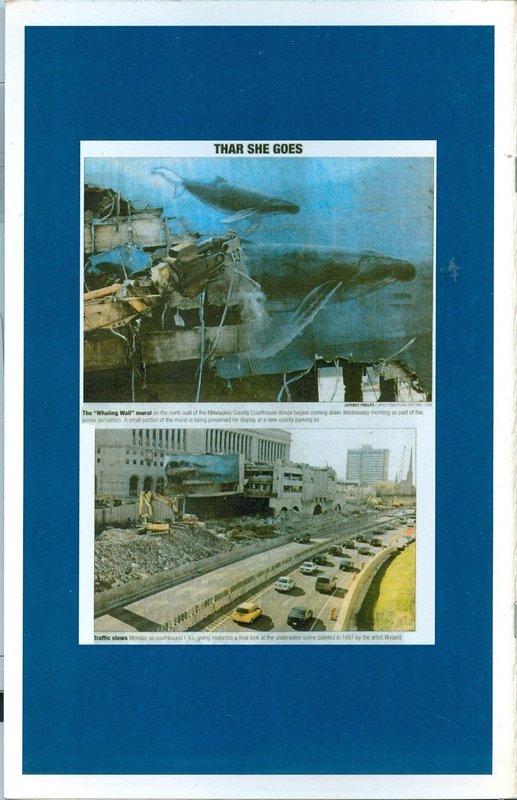 The city destroyed the mural, titled “Whale Commuters,” during Courthouse reconstruction on May 23, 2006. The mural lasted less than a decade. An extenuating circumstance was that once a freeway driver apparently looked at it a moment too long and a fatal multi-car pile-up ensued. So the city simply destroyed it, instead of relocating the mural to a less distracting location. There are 79 cities worldwide which have commissioned Wyland’s Whaling Walls. But Milwaukee couldn’t handle the truth of this wondrous art. The city screwed up royally. The story gets worse. 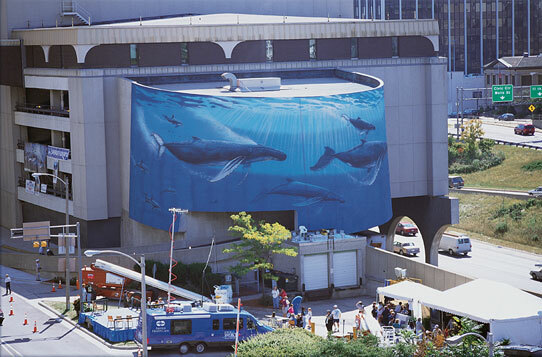 Wyland later offered to paint a whale wall on the Wells Street side of the Milwaukee Public Museum, the building he had originally wanted to do. However, as was the original problem, the museum has refused the offer due to the lack of any connection between Milwaukee and the ocean and therefore whales as well. Yet seagulls had live nests with eggs destroyed in the mural site demolition. Yes, such a move would’ve been more effort and cost than simply demolishing the whale mural. But since then, millions of tax dollars and countless hours of labor have poured into ongoing freeway development and expansion — much of it questionable — and destroying natural habitats around Milwaukee County. My friend Ann Peterson not long ago saw a solitary Great Blue Heron searching around above the ugly far west side freeway construction site for the natural habitat he had previously returned to as part of its natural habitat. Front and back covers of Jeff Poniewaz’s chapbook. 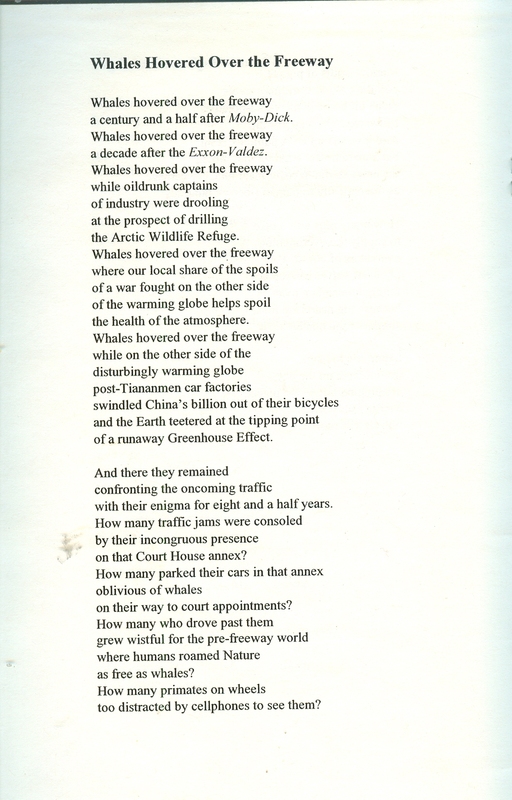 Images and reproduced poem below copyright 2007 by Jeff Poniewaz and Inland Ocean Books. The mural destruction, and its significance to our city, should not be dismissed as water over the bridge, or expressway. Atonement and wiser choices still await past mistakes and transgressions, especially when nature-ravaging development continues heedlessly. Jeff’s now-airborne spirit won’t die or stop fighting for a more harmonious relationship between humanity and our environment. 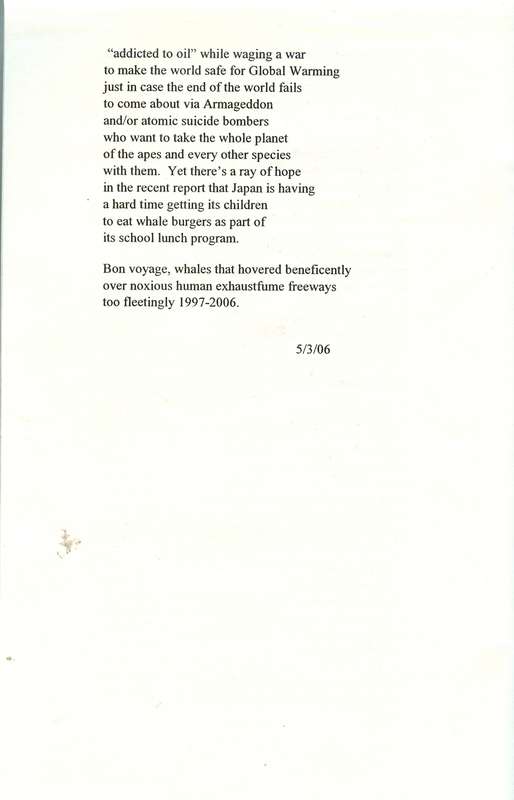 Here is Jeff’s title poem from his collection, along with the chapbook’s cover photographs which illustrate the whale mural’s fate. He chose the Melville quote at the end to conclude the poem. Spread your wings sweet Jeff and soar, yet always circle back to us. We need you still. As our mutual friend Richard Gallas declared at yesterday’s memorial, no poet he knew was more fierce than Jeff. Gentle, loving, and righteously fierce. 1 In 2008, twenty-seven years after Wyland’s quest began, the artist and the Wyland Foundation completed the monumental goal of painting 100 life-size public marine murals. These murals were painted in life-size dimensions to increase appreciation and understanding for aquatic habitats and the life within. Perhaps, most importantly, they have reshaped attitudes about marine life conservation. 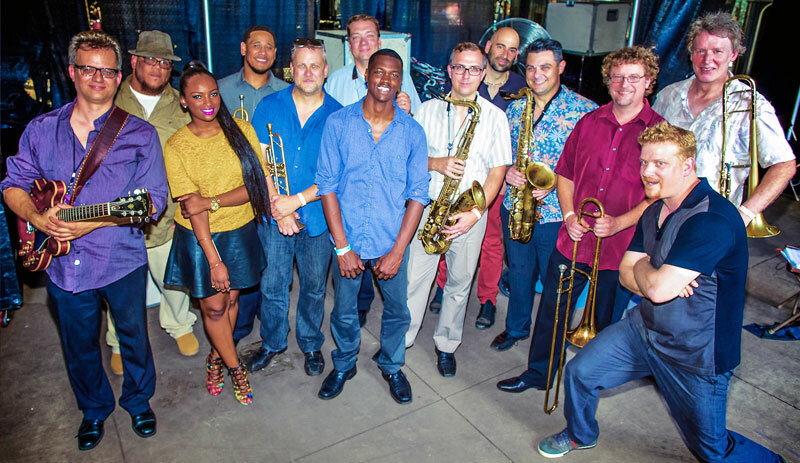 This powerhouse 13-piece heartland jazz band shouts and signifies mightily, striving to bridge America’s huge political divide by universalizing the group’s social values. On the CD cover, the Yestet’s name and album title adorn golden meshing gears—the economic promise of an America that works together, by contrast to our dysfunctional “just say no” Congress. Trombonist-bandleader-composer-arranger Joel Adams holds passionate political viewpoints. The Madison native sometimes irked club owners who feared his pointed onstage comments might turn off customers.The band’s first album Jazz is Politics? (released during the last George W. Bush administration) conveyed what James Baldwin called “the fire next time,” prophesizing our current race-relations crisis. A savvier Adams now accents the positive and the progressive, with wit and populist eclecticism. The Yestet promotes purposive commonality to overcome polarization and the forsaking of the middle class and the poor.From the opening bars of “In the Here and Now,” this recording bursts into your ears and head. Adams’ brawny clarion trombone solo introduces vocalist Maggie Burrell, who rides kicking waves of brass with insightful commentary about social media’s pitfalls of facile friendships and easy betrayals of confidence. (Continued below). Scott Burns’ Coltrane-esque tenor in the modal groove bespeaks the ’60s, and Adams’ belief that jazz should emulate that era’s activism.The Yestet also persuades with romantic analogy. “What Was Ours” recollects a strong relationship ruined by sexual politics. Their populist flair includes a cover of Paul McCartney’s philosophically yearning “The Long and Winding Road” with an added rap spin that works. Madison rapper Rob Dz’s vocal style and viewpoint blends stylish R&B allure with this hip-hop historian’s grasp of the spoken-word art. Dz conveys sensuality or sagacity with a tonal flip of a switch, without typical hip-hop macho posturing.This band’s bracing synergy embodies its values, without browbeating. 1. Yestet bandleader Joel Adams is a native of Madison, Wisconsin and a graduate of the celebrated University of North Texas jazz program. He has toured with Woody Herman’s Thundering Herd, and played with Joe Williams, Clark Terry and Dizzy Gillespie. He’s also worked for many years with Clyde Stubblefield, a drummer best known for his pioneering work with James Brown. In the Chicago area, Adams has performed with the Chicago Jazz Ensemble, John Faddis in the Chicago Jazz Orchestra, as well as with Doug Lawrence, Jimmy Heath and Arturo Sandoval. The current Yestet lineup includes the great trumpeter Russ Johnson, whose own CD Still Out to Lunch! I have reviewed here recently. Johnson moved to Milwaukee from the east coast and has added an exciting voice to the Midwest jazz scene. 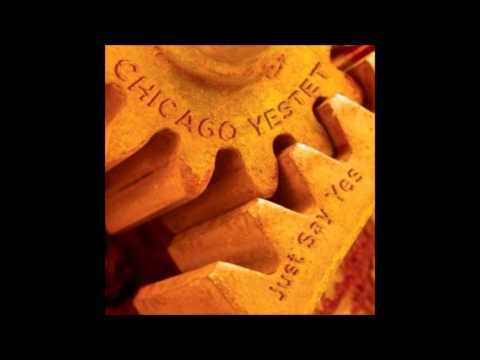 The Yestet CD is available on http://www.cdbaby.com/cd/chicagoyestet2 as is their first album Jazz is Politics? “Whenever I become discouraged (which is on alternate Tuesdays, between three and four), I lift my spirits by remembering: The artists are on our side! I mean those poets and painters, singers and musicians, novelists and playwrights who speak to the world in a way that is impervious to assault because they wage the battle for justice in a sphere which is unreachable by the dullness of ordinary political discourse.” — Howard Zinn, author of A People’s History of the United States and Artists in Times of War.